Hours: The metro opens at 5:00 a.m Monday through Friday and 7:00 a.m. on Saturday and Sunday. The metro closes at midnight Sunday through Thursday and at 3:00 a.m. Friday and Saturday. Two children per adult, 4 years old and under, ride metro for free. Food and Beverages are not allowed and must be kept in your bag. The metro will take you to within walking distance of all the city’s main attractions. The best thing to do when you arrive is buy each of your family members a SmarTrip card. This card looks like a credit card and holds a minimum of $10. The other option is a paper metro fare card. These should be used if you plan to ride the metro only once and need a single fare. If you plan to ride the metro more than once it will save you time and hassle to buy a $10-$20 SmarTrip card and use it for several trips. You also pay slightly less per ride if you use a SmarTrip card. SmarTrip and fare cards can be purchased at any metro station or online and act as a debit card. Keep in mind each person over the age of 4 must have their own fare card. A metro fare can range from $2.00 – $5.00 depending on how far you are going and what time of day you are traveling. $10.00 on each metro card would be a good start. Each time you leave a station you will run your card through a turnstile which will display how much money is left on your card. You can add money to the card at the kiosks found at each station. The metro is quite simple to use. 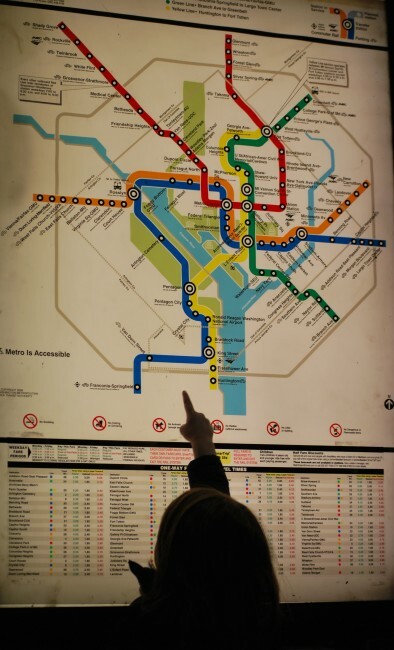 Pick up a metro map at the station or print one from their website before you leave home. There are 5 different color lines: red, yellow, green, orange and blue (sometimes you’ll find 2 lines share the same track). Once you determine which line you need, follow the signs to that line in the station. The direction of the train is indicated by the last station on that particular line. Confused? Click here to use the trip planner and don’t worry, you’ll be an expert after a few trips! The metrobus can be a bit intimidating as it is really designed for commuters, not tourists. Chances are you will not need to take the bus as major attractions are within walking distance of the metro, but if you know you will need to take the bus consult the metro bus route map before you head out. You may transfer from bus to bus and from bus to metro if you use a SmarTrip card to pay your bus fare. Hours: The metro bus runs 24 hours a day, 7 days a week, but the frequency of buses fluctuates based on the time of day. Strollers are allowed on the bus. As far as buses go, the DC Circulator is going to be the best option. It is much easier to determine which bus you need as it runs a bit like an above ground metro. There are colored lines representing each of the 6 routes and each route runs in a loop. The buses are red with Circulator written on the sides. You can use your SmarTrip card to ride the bus and the fare is only $1. Print out a map to keep with you if you plan on using the bus system. 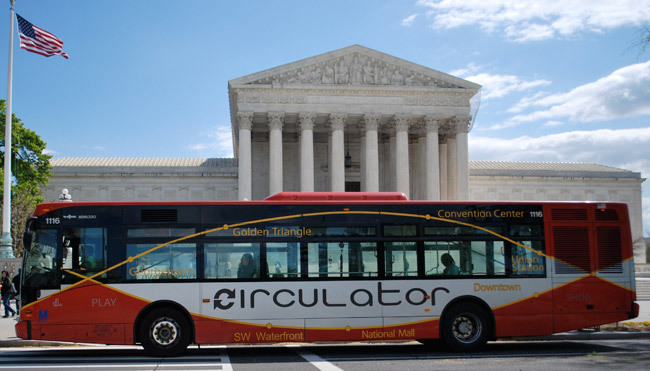 The Circulator would be a good option for getting to the restaurants and shopping in Georgetown for example. This is one of the few spots in the city where the metro does not go. The bus stops are located at metrobus stops and are indicated by an additional red and yellow sign. The buses are supposed to stop at each stop every 10 minutes. Each route has it’s own daily schedule. For more information on the bus and a detailed schedule click here. Strollers are allowed on the bus. Click here for a complete list of guidelines.